OAKLAND, CA, USA; SIENA, ITALY, 23 MAY 2018–If the entire human population led the lifestyle of Italians, Earth Overshoot Day would fall on May 24, according to Global Footprint Network, an international environmental research organization. Earth Overshoot Day marks the date when humanity has used all the resources the planet can regenerate in the entire year, as measured by Ecological Footprint accounting. The Ecological Footprint measures humanity’s annual demand for natural resources; it can be compared to biocapacity, which measures the Earth’s annual capacity to regenerate such resources. 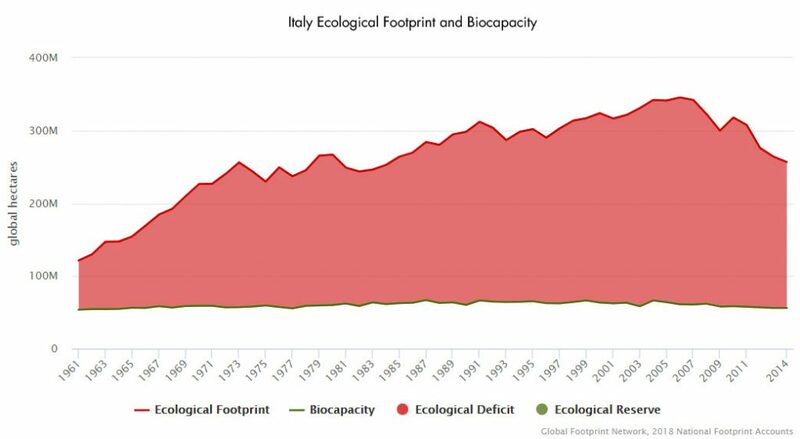 Italian Overshoot Day is calculated by scaling the average Italian Ecological Footprint per person to the global population and then comparing it to global biocapacity. Earth Overshoot Day has been moving earlier on the calendar almost every year since humanity started running an ecological deficit in the early 1970s. The costs of the global ecological deficit are becoming increasingly apparent in the forms of deforestation, soil erosion, loss of wildlife habitat and biodiversity, the accumulation of carbon in the atmosphere, and climate change. At 4.3 global hectares (gha) per person, Italy’s Footprint is noticeably higher than the Mediterranean regional average (3.2 gha per person), although slightly lower than that of France (4.7 gha per person) and higher than the Footprint of Spain (3.8 gha per person). Italy’s Footprint is mainly driven by transportation and food consumption. Focusing on those two areas of daily activities would therefore yield the highest possibilities for turning the tide and reducing the Footprint of Italians. 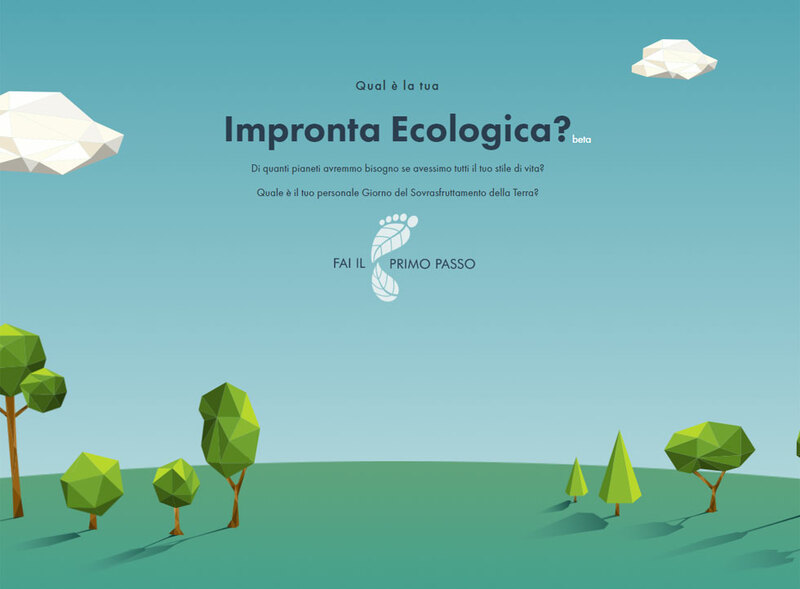 The launch today of a new Italian Footprint Calculator enables Italians to explore how their own daily activities drive their Ecological Footprint, or demand for natural resources. Global Footprint Network launched the new Footprint Calculator at www.footprintcalculator.org/it in partnership with Fondazione Monte dei Paschi di Siena, a Tuscan nonprofit organization that promotes the socioeconomic development and sustainable wellbeing of the Siena community. A person’s Ecological Footprint represents the amount of productive area required to provide everything that person demands from nature, including the production of food, fiber and wood, the accommodation of urban infrastructure, and the absorption of their carbon dioxide emissions from burning fossil fuels. In addition to measuring an individual’s Ecological Footprint, the Calculator lets users determine their personal Overshoot Day—the date of Earth Overshoot Day if all of humanity lived the same lifestyle as that user. In 2017, Earth Overshoot Day fell on August 2, so a Personal Overshoot Day prior to August 2 means that the user’s demand on nature is above the global average. A Personal Overshoot Day before May 24 means the user’s Footprint is higher than that of an average Italian. A Personal Overshoot day before May 5 means a Footprint higher than the average French resident, and a Personal Overshoot Day earlier than May 2 means a Footprint higher than the average German. 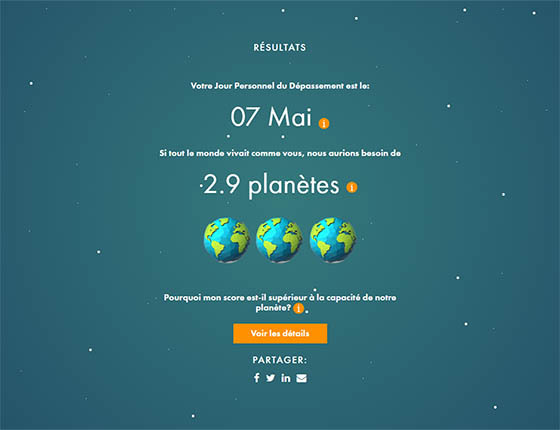 Fun and mobile, the Footprint Calculator also invites users to help move back Earth Overshoot by taking charge of managing their individual Ecological Footprint, suggesting sustainability solutions, and inviting them to share them on social media with the hashtag #MoveTheDate. More than 1 million people around the world, including a large proportion of students and educators, have used the Global Footprint Network Footprint Calculator since the release of the newly designed mobile-friendly version on August 2. The calculator is based on the latest data and methodology from the Global Footprint Network, which measures the Ecological Footprint and biocapacity of more than 200 countries and regions from 1961 to the present day. 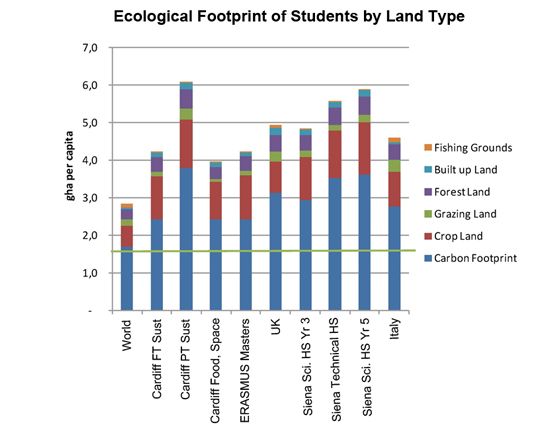 These resource accounts, based on United Nations data, are available for free on the Ecological Footprint Explorer open data platform at data.footprintnetwork.org. tools and analysis to guide decision making. Fondazione Monte dei Paschi di Siena is an Italian nonprofit organization that promotes and supports socioeconomic development of the Siena community. Established after the Italian banking sector was restructured in the 1990s, the organization’s mission is to support widespread sustainable wellbeing by playing a constitutive, proposing, and collaborative role and providing innovative knowledge and design to other institutions with a shared strategic vision.